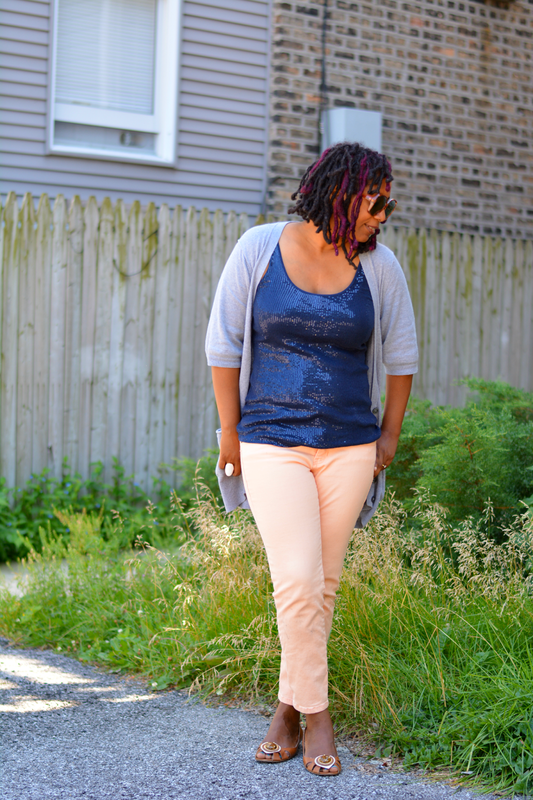 Sequins makes me happy so they are absolutely appropriate for SAHM style. They add the extra sparkle to my day when coffee is not enough. I pulled this sequin top out in my hazy, half asleep phase and knew I had to wear it for the day's errand running adventures. A friend was kind enough to gift this Savers find to me knowing my affection for those shiny orbs. She pulled it out of her bag while we were at the flea market. How perfect is that? Thrift gifts at the mother of all things thrift. Surprisingly, these were the only sequins I spyed that day. Flea markets have everything you could ever want except sequins. Shrugs. Sequins are a yes. Arm exposure is a maybe which is why I'm sporting a sweater. It also keeps the summer chill at bay. I love how slouchy and oversized it is and I even like the cropped sleeves. That's something I would normally find weird on a sweater but it's perfect for cool summer days. Grey also takes down my sequins a notch. Just a little bit so people don't think I'm going clubbin' (I'm a fan of old school lingo). I was somewhat surprised by my creamsicle orange jeans choice. 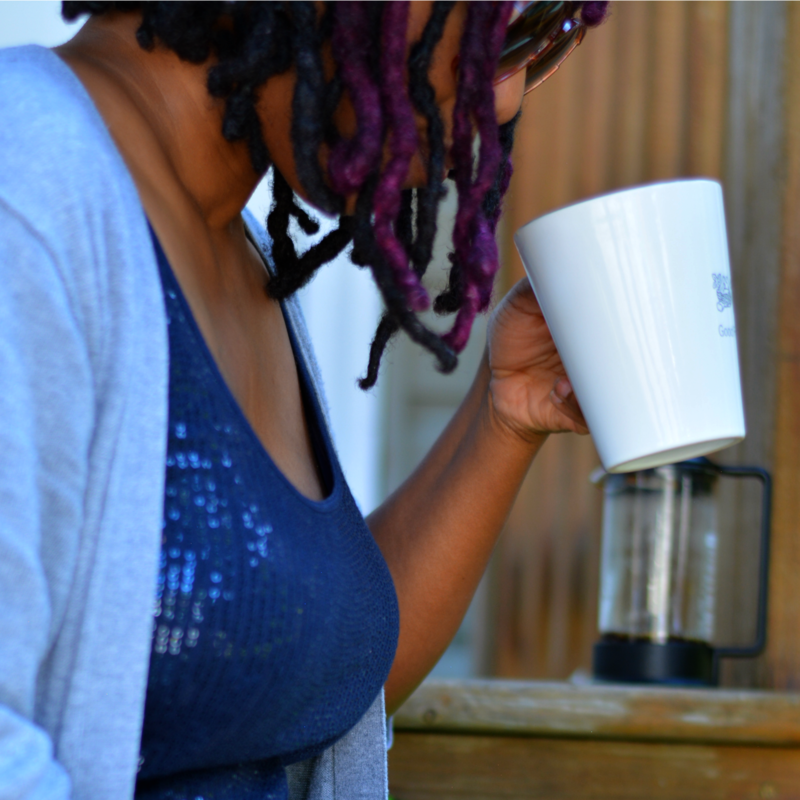 When I'm a little unsure of what goes with what, I tend to lean towards safety. Plain old blue jeans would have been the comfort selection. I saw these first though. It's been a while since I've actually laid eyes on them. They were buried in the laundry mountain. Last sighting was in May! 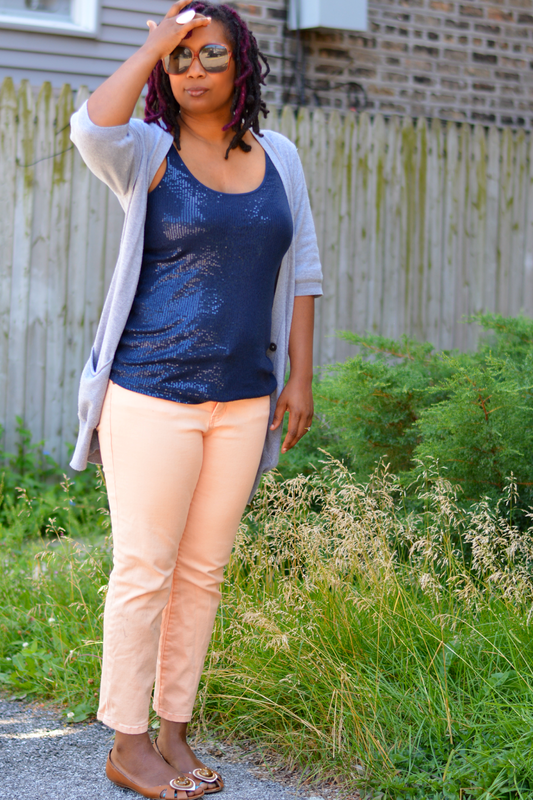 Are sequins a part of your SAHM style? I have some .99 starting bid eBay auctions listed! Coach, B. Makowsky, and Tod's are up for grabs. 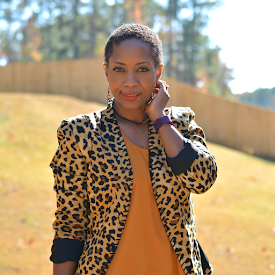 Linking up with the lovely ladies of What I Wore Wednesday. I love the orange and blue together. This summer has been so cold and ...not summery! I've been wearing cardigans too. 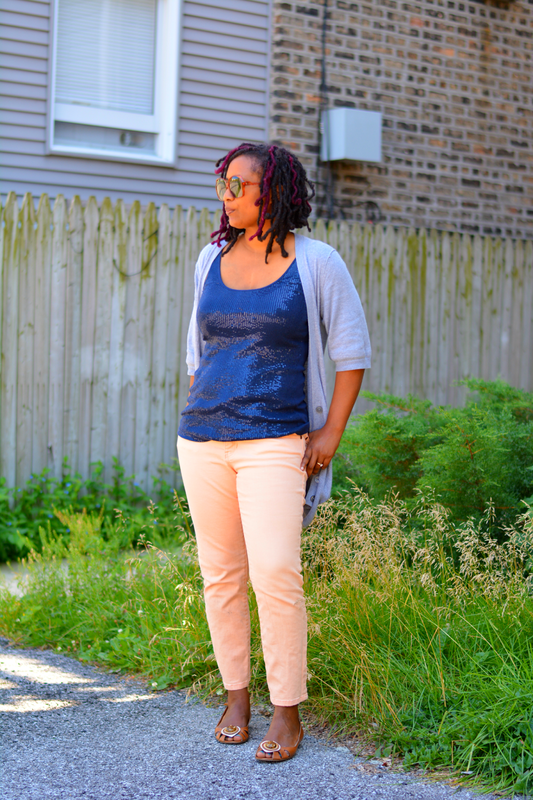 I really like this color combo and I totally agree that sequins during the day can be a yes. This is a great outfit! Sequins should be EVERYONE's style! Girly, chic, cute and always GORG! Love how you paired them here with that color jeans. Great choice. Love those peach pants!! 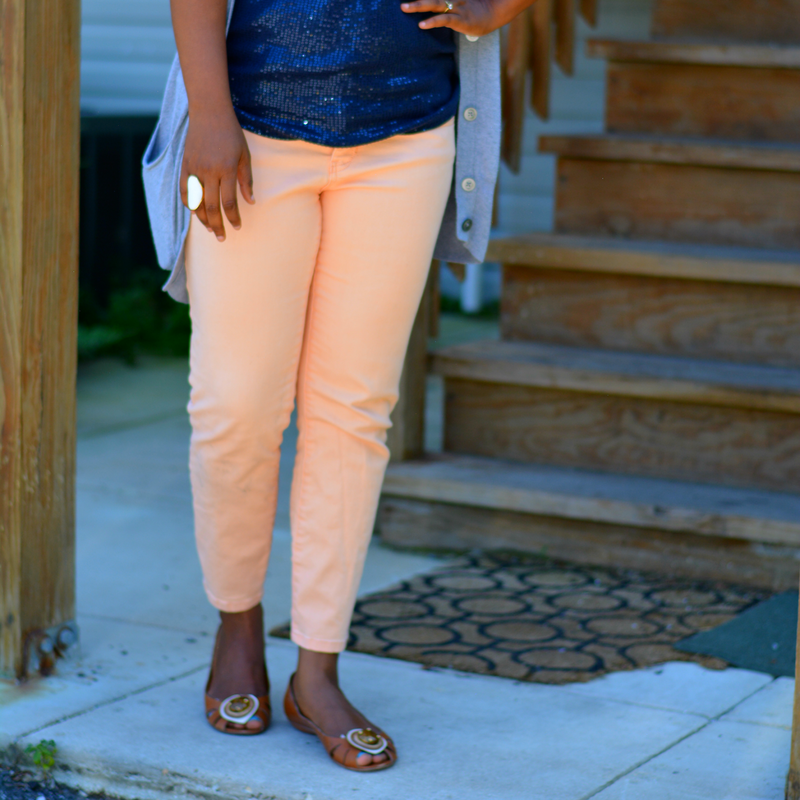 And the peach and navy combo is unexpected and oh so good!